By Paul Farmer. Written from the front lines of the war against AIDS, tuberculosis, malaria and typhoid and shows why, even more than those of history, they target the poor. 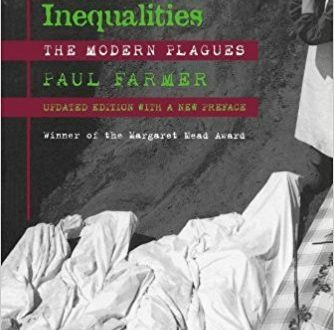 A “peculiarly modern inequality” in the modern world, that feeds emerging (or re-emerging) infectious diseases such as Ebola and cholera, bare in exposed in stories of sickness and suffering. Challenging the accepted methodologies of epidemiology and international health, points out that most current explanatory strategies, from “cost-effectiveness” to patient “noncompliance,” inevitably lead to blaming the victims. In reality, larger forces, global as well as local, determine why some people are sick and others are shielded from risk. Includes what can be done in the face of overwhelming odds, by physicians determined to treat those in need. Read more.